I have been reluctant to write more about the situation at work. There was too much speculation and misinformation I feel to be accurate. Now, however it seems like everything is spelled out for me. 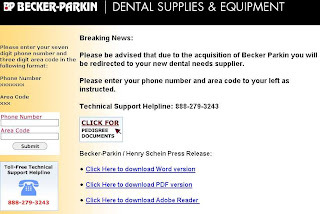 Henry Schein came in to every Becker-Parkin office on Thursday afternoon and changed the locks. They informed the employees at the location I was in that they would probably not be needed after inventory which would run until Saturday or Sunday depending on the location. They also stated that a package would be delivered to each employee with information regarding their last date of work (some were retained longer than the weekend) and severance package. I was in our San Leandro, CA office for this. BP corporate needed a representative in each location to supervise the inventory and make sure that things were fair. It was rough seeing the three remaining people there find out that they were done. They all knew that they were going to have to leave already, but they had been told originally that they would still have a couple more weeks. I guess I should be flattered that Barry, Marty, Sergey, and the other executives feel highly enough of me to send me to do this. Part of the deal included a trip to southern California to visit the parents, which is where I am writing this from. I head home Wednesday, and will be in the office Thursday to help them with the last remaining tasks of shutting down. I stated in an earlier post that I was doing well with my job prospects. Well, I accepted a position at AOL in Manhattan. Those that know me will laugh about this, but if you could have been with me on the interview I think you would have understood why I took the job. It seems like an amazing place to work. I feel that there is a good future in my new job, and I know I will enjoy working at 75 Rock. I hope that all of my friends find something as good as I have. I will also constantly be on the look for jobs for those that haven't. I have more to say about the Schein-BP transaction, but I will wait until it is COMPLETELY over for that. In the mean time, please watch this space for news, and things that I find amusing. Everyone take care, and keep in touch!